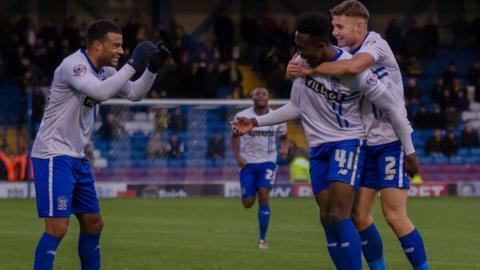 Bury remain in the League One play-off places after a first-half own goal settled their meeting with fellow promotion challengers Burton Albion. The only goal of the game came when Leicester City loan striker Joe Dodoo's low cross looped inside the far post off Jerome Binnom-Williams. Tom Pope and Leon Clarke almost doubled Bury's lead, both seeing close-range efforts blocked on the line. Burton could not find an equaliser despite creating a string of efforts. Phil Edwards and Mark Duffy almost beat home keeper Daniel Bachmann at his near post, while Callum Reilly fired just over. Bachmann then parried a rasping strike by Binnom-Williams and El Khayati twice fired over. But it was Bury who came closest when, after coming off the bench, fit-again midfielder Kelvin Etuhu's 20-yard strike was tipped onto the bar by Burton keeper Jon McLaughlin. David Flitcroft's Shakers, in sixth, move to within two points of Jimmy Floyd Hasselbaink's Burton, who have dropped to fifth. "It was a very professional and focused performance. "First half we were outstanding in possession. "Second half it was a different game." "It's very frustrating. They had a lot of the ball but we had the chances with Nasser El Khayati and Stuart Beavon. "It was a 100% penalty and then when it is a 100% penalty the referee has a decision to make - to send him off. Then it is a totally different game. "I don't know what he has seen - or hasn't seen - but Stuart is chipping the ball over the goalkeepers legs, like a good striker would do, and the goalkeeper is coming with his feet. Everywhere on the pitch it's a free kick. What's the difference?" Match ends, Bury 1, Burton Albion 0. Second Half ends, Bury 1, Burton Albion 0. Attempt missed. Mark Duffy (Burton Albion) right footed shot from outside the box is too high from a direct free kick. Chris Hussey (Bury) is shown the yellow card. Foul by Tom Soares (Bury). Aurélien Joachim (Burton Albion) wins a free kick in the attacking half. Corner, Burton Albion. Conceded by Chris Hussey. Substitution, Bury. Danny Rose replaces Leon Clarke. Chris Hussey (Bury) wins a free kick on the right wing. Substitution, Burton Albion. Callum Butcher replaces Shane Cansdell-Sherriff because of an injury. Foul by Jerome Binnom-Williams (Burton Albion). Substitution, Burton Albion. Aurélien Joachim replaces Stuart Beavon. Corner, Bury. Conceded by Jon McLaughlin. Attempt saved. Kelvin Etuhu (Bury) right footed shot from outside the box is saved in the top left corner. Attempt blocked. Danny Pugh (Bury) right footed shot from the centre of the box is blocked. Leon Clarke (Bury) wins a free kick in the attacking half. Foul by Callum Reilly (Burton Albion). Foul by Leon Clarke (Bury). Shane Cansdell-Sherriff (Burton Albion) wins a free kick in the attacking half. Foul by Danny Pugh (Bury). Callum Reilly (Burton Albion) wins a free kick in the defensive half. Substitution, Bury. Craig Jones replaces Joe Dodoo. Attempt missed. Abdenasser El Khayati (Burton Albion) right footed shot from outside the box misses to the right. Corner, Burton Albion. Conceded by Daniel Bachmann. Kelvin Etuhu (Bury) is shown the yellow card for a bad foul. Attempt saved. Jerome Binnom-Williams (Burton Albion) left footed shot from outside the box is saved in the centre of the goal. Substitution, Burton Albion. Timmy Thiele replaces Lucas Akins. Attempt missed. Shane Cansdell-Sherriff (Burton Albion) header from the centre of the box misses to the right. Philip Edwards (Burton Albion) wins a free kick on the right wing. Hand ball by Leon Clarke (Bury). Lucas Akins (Burton Albion) is shown the yellow card for a bad foul. Lucas Akins (Burton Albion) wins a free kick in the attacking half. Substitution, Bury. Kelvin Etuhu replaces Tom Pope.